Turf Was is currently newestupdated gameplay between guilds added into Magerealm. This gameplay is availableto players lvl 40 and higher. Only the strongest may join! Boost yourbattle rating and fight with your friends! You can access Turf War bygoing into Daily Event\'s -> Guild -> Turf War. System is accessable from10:00-22:00 from Monday to Thurstday every week. 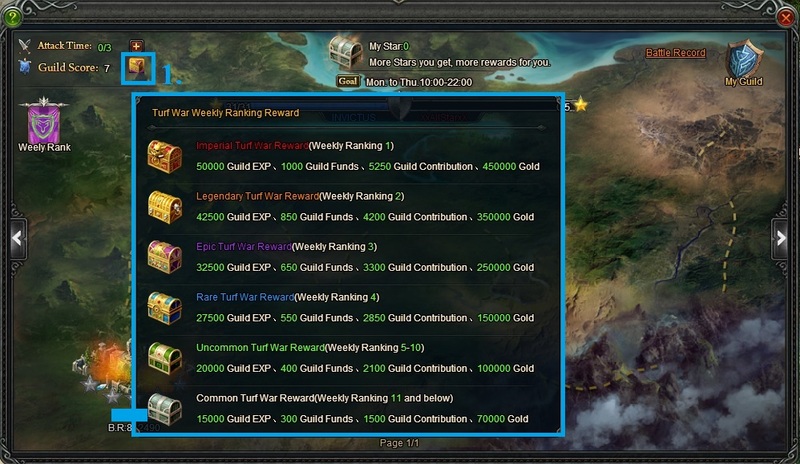 Only top 6 guilds can jointhis system and fight against other guilds to gain more resources. Click on Join toaccess the gameplay. 1. )This Building is the enemy player shown right after youenter the turf war. (Each enemy player will be shown as buildingwith their IGN and B.R. showing. 3.) By clicking on MyGuild you can access Buildings of your friends fromyour guild and your own as well. 1. )Weekly Rank, click on this icon to see your weekly ranks. 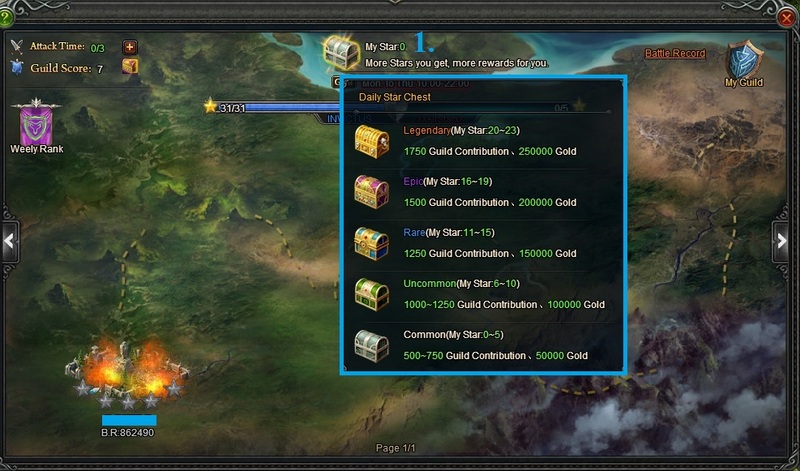 You can see lighted 5 starsat each of your guildfriends. When your friends will be attacked theywill lose 1 of their stars (may lose all of them also) if your friendis killed. The more stats the enemy choose to attack you the strongerboost you´ll gain, or the lower the starts they choose the weakeryou get. 1. 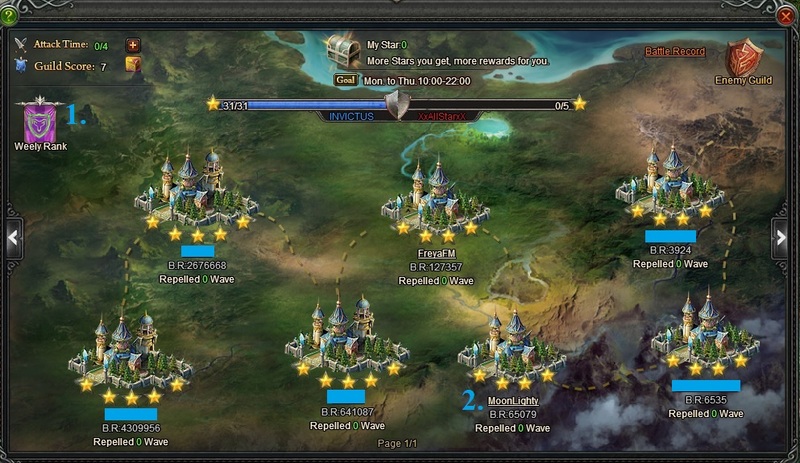 )If you choose 1 Star challenge enemy\'s BR will be lowered by -20%. 3.) If you choose 3 Starchallenge enemy\'s BR will stay the same as they have. 4.) If you choose 4 Starchallenge enemy\'s BR will be boosted by +10% in BR. 5.) If you choose 5 Starchallenge enemy\'s BR will be boosted by +20% in BR. It is dependable of star youchoose that the enemy BR will be. When your opponent lose all hisstars he cannot continue playing in this turf war (not as long as theevent is on, but it is meant the enemy is killed and he cannotcontinue with the current match). 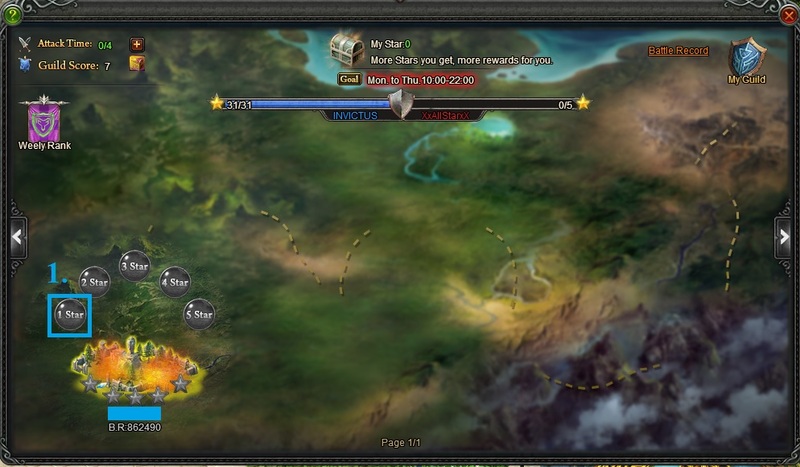 Let\'sget back to the main interface you´ll get when you join the War. 1.) Daily Star chest. Themore you gain stars from challenging enemy the better rewards you canget daily! 1.) We have also preparedoverall ranking rewards which can be collected after the whole eventis over. Hope you will enjoy this new gameplay in our game! Do not hesitate to ask questions as our moderators will answer them for you! 3.) If you choose 2 Starchallenge enemy\'s BR will stay the same as they have. This is the worst part If a guild with low players but consists of many Heavy cashers. But seems that would cost alot .. so not worth at all. 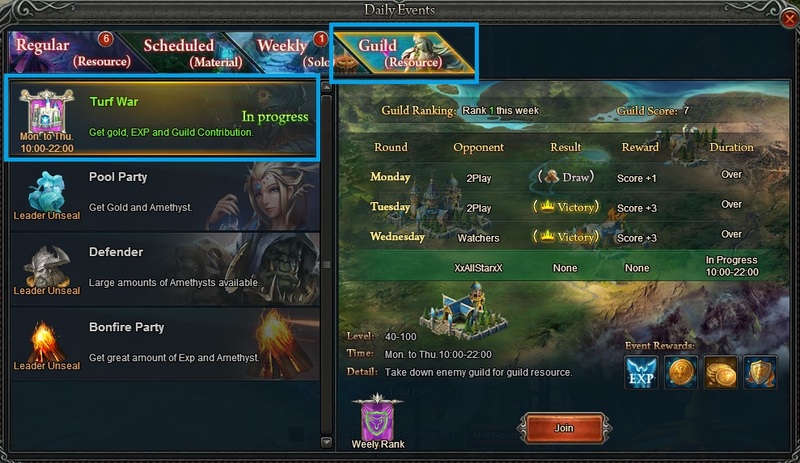 Can we make tactics like.. beat the best one of a guild so he cant attempt the whole day ? Have to ask that much, sorry. 2019-4-23 00:49 GMT+8 , Processed in 0.063231 second(s), 52 queries .